The Langley Kwantlen Student Association is putting on its first-ever speed-dating event on Feb. 11, just in time to find a last minute date for Valentineâ€™s Day. The idea came from Jennifer Campbell, campus representative for the Langley campus. She recognized that there were a lot of singles on campus and found that there was an interest when the KSA did a survey last September. Speed-dating events are popular at universities, she said. If successful, the KSA will look into putting them on at other Kwantlen campuses. â€œI think itâ€™s good because itâ€™s a way for students to get to know each other through different programs,â€ she said. The speed-dates will take place on-campus, in the cafeteria from 7-9 pm. They will be about five minutes long and students will receive a package of icebreaker questions at each table. At the end of each date, students will write down whether they like the other, and if thereâ€™s a match, they will receive each anotherâ€™s email at the end of the event. If you want to join, visit the Langley campus and register at the Kwantlen Student Association. Sign-up sheets are on the door of the KSA office. As part of the 2009 spring semester Welcome Week, the Kwantlen Student Association will present its first-ever Underground Club Night. From 6-10 p.m. Friday (Jan. 16), Dj Flip out and C Stylez of The Beat 94.5 will be spinning hip-hop, rap, and top-40 tunes in the Grassroots CafÃ© at Kwantlen’s Surrey campus, which will be transformed into a nightclub atmosphere with lights, drapery and a smoke machine. The venue will also have a licensed area on the patio, which will be tented and heated. Cover is $5 for residents and non-Kwantlen students and free for students with a Kwantlen ID card. The KSA has been working on the event with James Menear from Precision Entertainment, who also worked with the on Cram Jam, and DJs, equipment, and decorations have been supplied by Galactic Entertainment. Richmond students were welcomed back to classes on Tuesday by a wide array of information on free school services, employment opportunities and every studentâ€™s favorite — free stuff, courtesy of the Kwantlen Student Association. The festivities were part of Welcome Week, which is going on at campuses all week. Free stuff included airbrush tattooing, pizza and giveaways, including a contest for a home theatre system. Students like free food, said Reena Bali, Richmondâ€™s KSA campus representative, who added that theyâ€™ve found that free food results in a better student turnout. The KSA booths displayed information for students about benefit plans, free services and a confirmation they are currently fighting for the UPass. 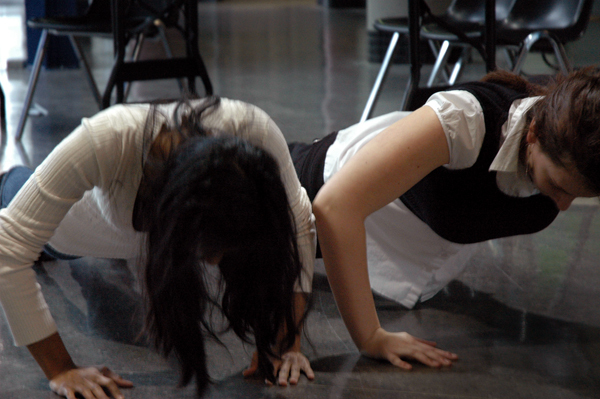 At a nearby table, the Student Health Improvement Program (SHIP) program was giving away an iPod, but required contestants to do push-ups in order to enter the contest. Other tables featured fitness centres recruiting new members and offering free swag. Big Sister and other mentor programs set up booths displaying information on volunteer opportunities. The Canadian Border Services Agency also had its own table, recruiting student employees. The Richmond KSA began planning the event in December during the winter holidays, said Bali. She estimated that they spent less than half of the eventâ€™s $1,500 budget, adding that sponsors were easier to find this year, because of Kwantlen’s new university status. For those who missed the events Tuesday in Richmond, Bali said the KSA will probably be giving away free snacks tomorrow. Thursday, Rock Band will be set up in the rotunda around noon on a large projector screen and the KSA will be giving away snacks and prizes. â€œToday, I think, was a huge success due to all the planning and everyoneâ€™s hard work,â€ she said. Kwantlen Polytechnic University will showcase all 135 of its programs at the Big Big Open House, on the Surrey campus on Friday, Feb. 27 and Saturday, Feb. 28, from 9 a.m. to 4 p.m. both days. The open house will feature campus tours, information displays, workshops, games, food and prizes. More information is available by emailing bigopenhouse@kwantlen.ca.